For pond up to 140,000 litres without fish , 90,000 litres with fish. For ponds up to 5,000 litres without fish or 2,500 litres with fish. 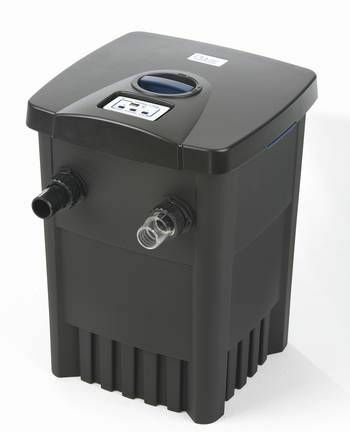 Includes integrated 7 watt UV and 1500 litres per hour pump. A filtration system is the best method of maintaining clear, healthy water in your water feature. To keep your pond clear you require a combination of water circulation by means of a pump. A UVC clarifier for eliminating suspended algae as well as biological/mechanical filtration in your pond filter to withdraw pollutants and substances that cause cloudiness from the water. 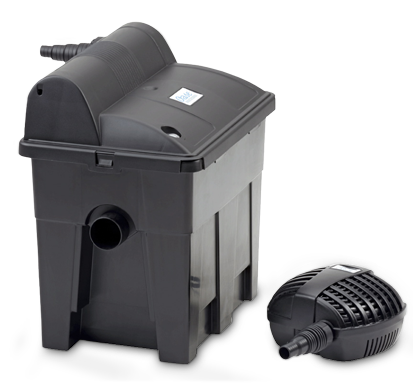 A filter system is sized based on the volume of water in your pond and whether or not you have fish. The more water in your water feature the bigger the filter required to prevent green or brown water. To make selecting your feature as easy as possible all our filters have a number with them which reflects the maximum amount it can clean. For example a Filtoclear 3000 can clean 3000 litres of water. 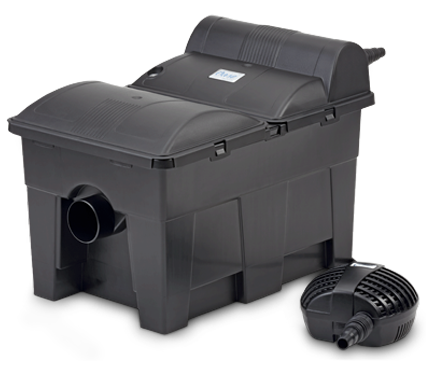 If your pond has fish , but not Koi, this cleaning figure is reduced by half, so a Filtoclear 3000 will clean 1500 litres of water if there are fish in the water. 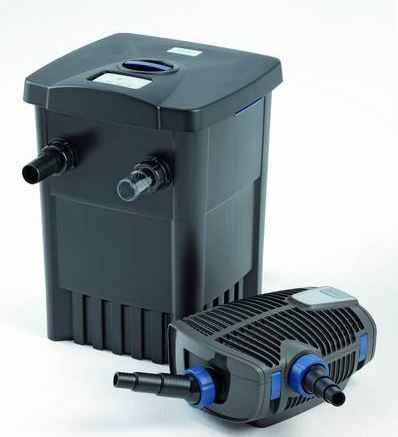 All filter systems consist of a pump to circulate the water, a UV (ultra violet) clarifier to destroy water borne algae and pathogens as well as a filter media catchments box. All filtration systems must be chosen and sized based on the volume of water in your pond AND whether or not you have fish. Under sizing a filter of little benefit but you cant oversize. The UV light eliminates suspended algae, bacteria and pathogens and consequently it is indispensable for clear pond water. Tip! 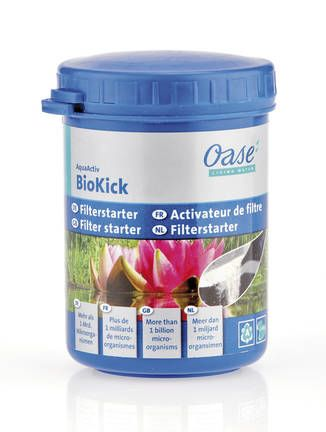 Important micro organisms that biologically clean the water settle on the sponges of the pond filters. These micro-organisms feed on minute particles that we see as debris. A new filter only attains its full performance capacity gradually as the microbiology must first establish itself. To accelerate this process always add BioKick starter bacteria. In addition ensure that there is additional oxygen - for example with an AquaOxy pond aerator. You can also download our brochures by clicking here.